The United States has a new minting facility that took over the title as the largest private facility in the country in 2015. Elemetal Mint marks the combination of three brands within the precious metals industry, with the goal of providing investors and collectors with top-notch service and an excellent range of products. 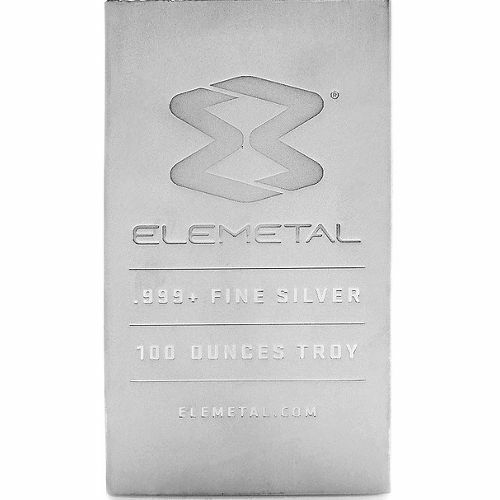 Right now, the 100 oz Silver Elemetal Mint Bar is available on Silver.com. Product arrives in all-new condition in protective plastic. Rectangular design with sharp edges, matte finish. Elemetal Mint branding on the obverse side. Struck by Elemetal Mint, an IRA certified facility. Despite the vast array of silver and gold bullion coins available on the market today, many investors still turn to traditional gold and silver bars to protect hard-earned wealth. The 100 oz Silver Elemetal Mint Bar is an excellent example of investment-grade bullion bar design. Each of the 100 oz Silver Elemetal Mint Bars in this Silver.com product listing is an all-new product from the mint that ships to you in a plastic sleeve to protect the bar’s value. As Elemetal Mint gets its production lineup running at full capacity, more new products such as these will appear for investors to choose from when shopping. On the obverse face of the bar you’ll find the engravings arranged vertically from the top of the bar to the bottom. At the top of the silver bar you’ll find the Elemetal logo, which uses the “E” and “M” from Elemetal Mint to form the infinity logo. Additional engravings identify the bar’s weight, purity, and metal content. If you have any questions about these 100 oz Silver Elemetal Mint Bars, please don’t hesitate to ask. Silver.com associates are available on the phone at 888-989-7223. You can also connect with us online using our live web chat and email features.